Spelling is not a favorite subject at our house. Math was our nemesis but now spelling has suddenly thrown us for a loop, and is now very much despised! Spellcheck is not enough for me; I want my kids to be able to spell well and be confident writers with correct spelling. I’ve also noticed that my kids are visual learners. So, I was very excited to learn that Spelling You See was a new program to teach spelling in a very visual way. We were able to review two levels of this program – Level B – Jack and Jill and Level D – Americana! Spelling You See is a natural way to teach spelling without word lists or numerous spelling rules. The student learns to see and memorize letter patterns in words, practicing through copywork and repetition. The program is not designed to correspond to grade levels, but instead focus on ability level and work on mastery of concepts before progressing to a new level. This program teaches spelling through visual memorization of spelling patterns. 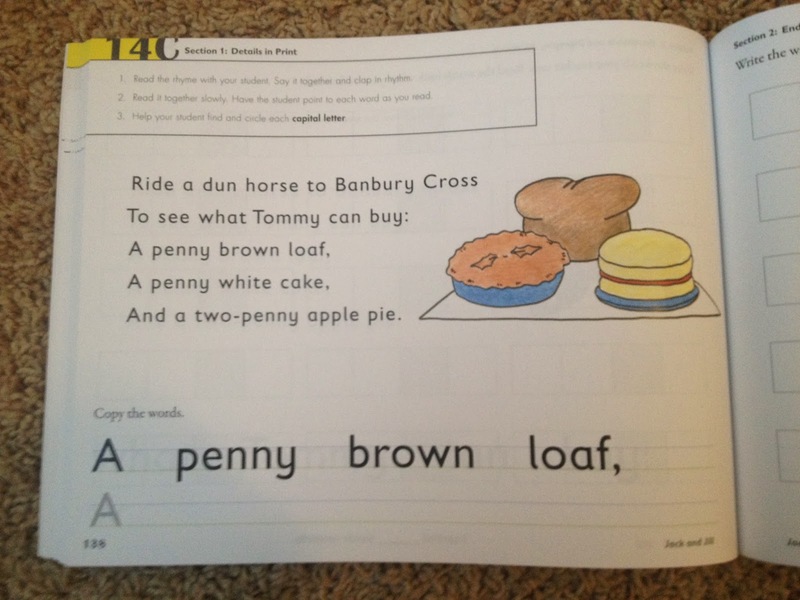 The student is taught to “chunk” common letter teams by coloring those teams in selected colors each time they are encountered in the readings. For example, “ie” is a common vowel team so it would be colored in yellow while a consonant team such as “ch” would be colored in blue to represent a consonant chunk. Each level of the program focuses on a different theme. There are currently 5 levels of the program available. The first level, Listen and Write, is for the youngest learners who are learning to form and write letters. 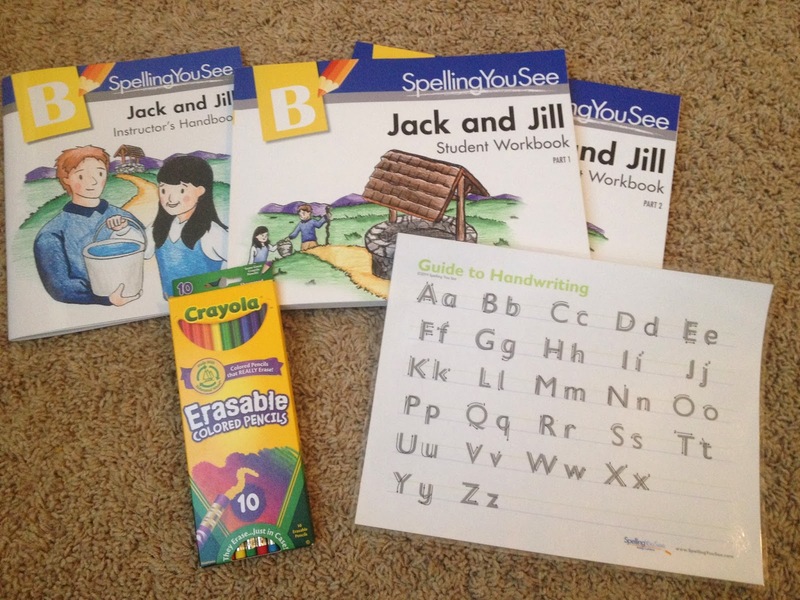 Jack and Jill is for students who are learning to distinguish individual sounds and are ready to copy short passages and spell words by dictation. Wild Tales, Americana, and American Spirit each build on the skills learned in the previous books by introducing longer passages, more detailed copywork, additional words with various letter teams to mark, and longer dictations to practice spelling. You can view placement guidelines at the website. There are 5 days of lessons for every week for a total of 36 weeks of spelling lessons per level. I had a fun and unexpected blessing with this review. I was accidentally sent the wrong level of the program in addition to the correct level I had requested. The wrong level was actually the perfect level for Tiger. So, I put Tiger (Kindergarten) in the Jack and Jill level while Curly (2nd grade) worked on the Americana level. I had 2 different levels to review and both fit our family very well! We received a printed copy of Jack and Jill, a PDF download of Americana for me to print (which was only available for reviewers – printed copies are the only purchasing option), a pack of colored pencils, and a laminated handwriting reference sheet. Day 1: We read the nursery rhyme together while I pointed to the words. Then we read it together while he pointed to each word. We did the short activity pertaining to the rhyme. For this day it was to circle all the capital letters in the rhyme. Then Tiger copied two line of the rhyme below. On the next page he traced and wrote several letters (while saying their sounds aloud) and then I dictated a few short spelling words that he wrote in boxes at the bottom of the page. The list of words to dictate is listed in the Instructor’s Handbook. Day 2: We read the rhyme together again, taking turns. The activity today was to underline all words that begin with the letter “r.” Then he copied the next two lines of the rhyme below. On the opposite page he traced and copied a few letters and wrote the dictated spelling words. Day 3: We read the rhyme and then he underlined all the words beginning with the letter “s.” He then copied more of the rhyme on the lines below. 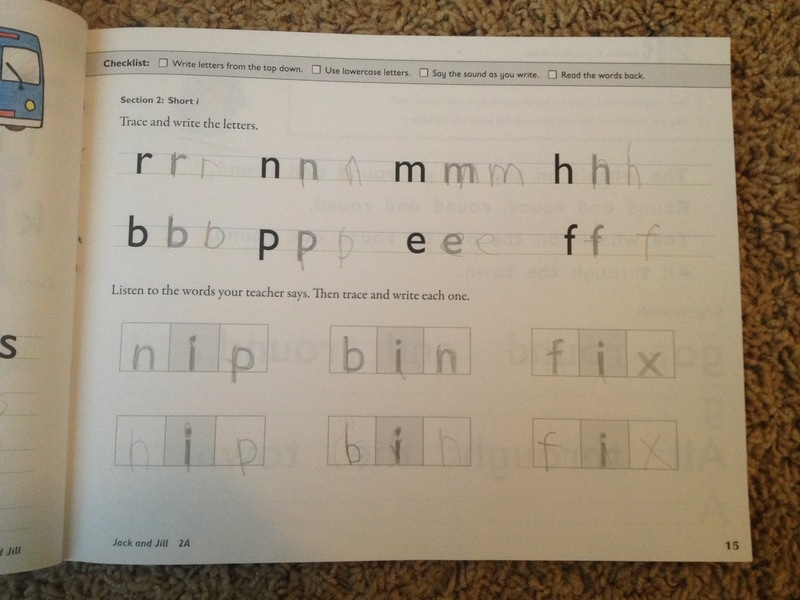 The second page was copying letters and writing dictated spelling words. Day 4: We read the rhyme and Tiger underlined words that began with “h.” He then copied his letters as we said the letter sounds and then he wrote the dictated spelling words. Day 5: We again read the rhyme and then Tiger underlined all words that began with the capital or lowercase “t.” We then said the letter sounds while he wrote them and I dictated the spelling words. 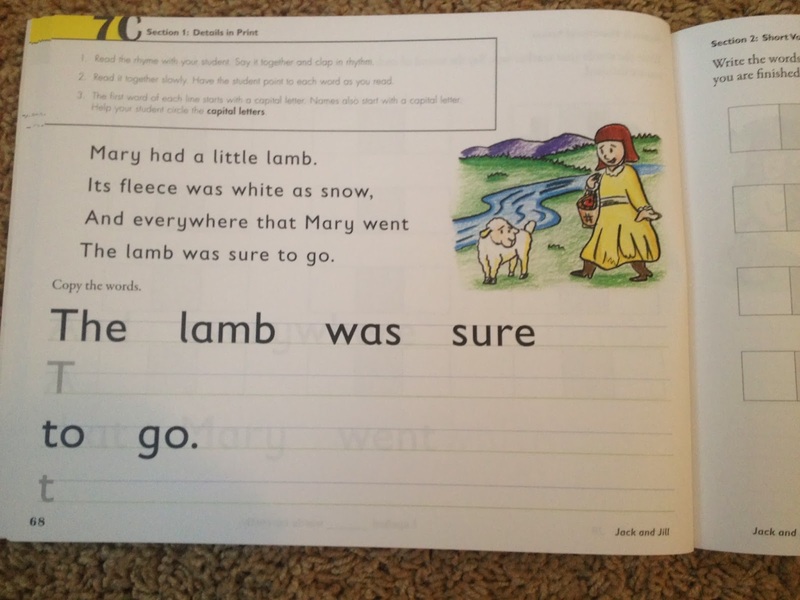 Later lessons in this level have longer copywork, more spelling words to write per day, and eventually dictation – where the student writes the rhyme as you dictate it to him. The instructions specify to read the story to your student first and then read it together while the student points to the words. Curly is a very fluent reader so she preferred to read the story out loud to me as I followed along. So we did modify the assignments slightly. Day 1: Curly read the paragraph to me and we talked about what she would be marking in the story. This week she marked vowel chunks in yellow (“ee,” “ie,” “aw,” “oo,” etc.) as well as consonant chunks in blue (“ch,” “gn,” “wr,” “tt,” etc.). She used her colored pencils to color in all the vowel and consonant chunks that she found. Then she copied the first part of the paragraph on the following page. 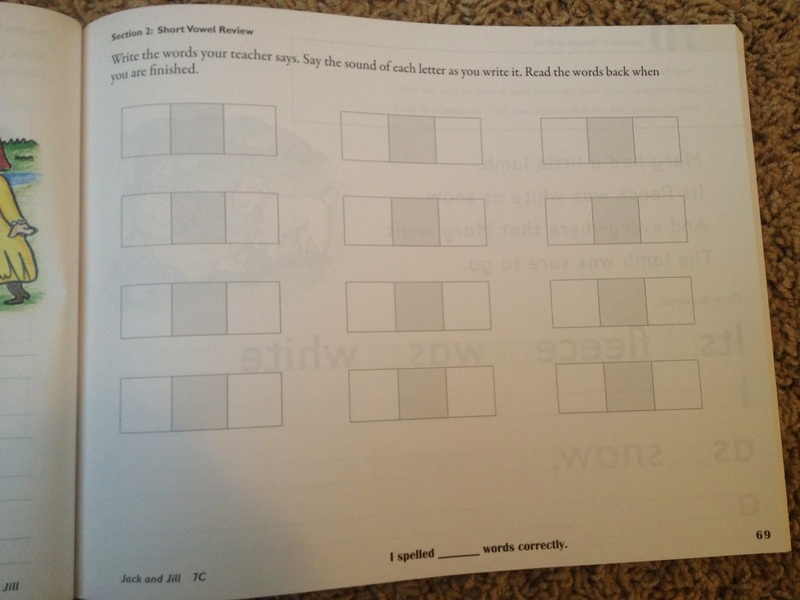 The instructions tell you to let the student work on this for 10 minutes and stop when that time is up even if they have not finished the sentences. It never took Curly more than 10 minutes for the sections so I had her do the copywork on her own time while I worked with one of her siblings. She then marked her copywork just as she had marked the paragraph. She brought it to me to check it for accuracy. Day 2: Curly read the paragraph to me again and we did the same markings. Then she did the copywork for that day, which was the last few sentences of the paragraph. She marked that page as well. Day 3: I listened to Curly read the paragraph and I watched her carefully mark it. Then she worked on the copywork (which was the first few sentences of the paragraph again). Day 4: Curly read the paragraph to me and marked it with her colored pencils. I dictated the paragraph to her one sentence at a time. She carefully wrote each sentence as she listened. I gave her all spelling help as she needed it, reminding her of what she had practiced during the week. Then she marked her finished dictation. Day 5: Curly read the paragraph for the last time and completed her markings. I again dictated the entire paragraph one sentence at a time. However, this time I did not provide any spelling help or guidance but rather let her write each word on her own. When she was done we reviewed each word and checked her spelling for accuracy. Then she went back and did all the markings. 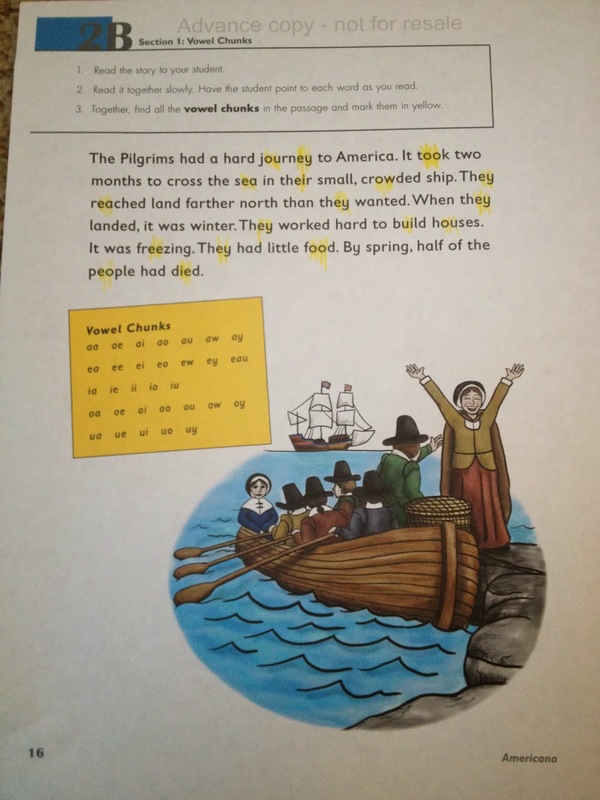 Each level of the program contains pages for the student to do the copywork. These pages have 2 lines rather than the standard 3-lined pages. Because our handwriting program has 3 lines it was very difficult for Tiger to transition to writing his copywork on the 2-lined pages. He was never sure where his “tall” letters should begin above the top line. He found this to be frustrating since he was not used to this type of paper. The printing used in the book is very easy to read. However, the “t” and the “l” are both curved at the bottom. This is not unusual for printed text but when a student is using it as a guide for copywork it can be confusing as the handwriting my kids have learned taught that a “t” and an “l” are both straight and not curved at the bottom. I had to remind Tiger to remember how he had learned the letters rather than him pick up the habit of curving those letters. The other letters in the books does look like regular printing save for those two letters. I wished that they looked more like standard printing so as not to confuse my little guy. The instructions for the handwriting page says to “write letters from the top down.” (This is in the Jack and Jill book). This is true of many letters except for letters like “d” which begin with the curved part and then go to the top and then back down. I omitted that instruction when I talked to Tiger so he would not be confused. The instructions for each page are printed clearly at the top of the student pages. I loved that I did not have to flip back and forth in the teacher guide to know what to do on each page. It was easy to know what I should be doing. I only used the Instructor’s Guides before I began the program to make sure I understand each lesson. I also used the guide to find the dictated spelling words for Tiger. But in general, I used the student pages without needing the guide. I found this very convenient! The repetition of the assignments did become tedious at times. However, I’m a firm believer that kids need lots of practice and repetition as they learn. So, even though my kids sometimes complained about reading the same rhyme or story again or copying the same passage again, I could see that each day the remembered a few more words and they made spelling improvements throughout the week due to the repetition. My kids found the stories and rhymes interesting and fun. They also enjoyed marking on their pages with the colored pencils. The various colors provided a very nice visual for them to start picturing spelling patterns. I could tell that this was very helpful for my little visual learners. The books are very colorful and bright. My kids enjoyed the pictures and found them inviting. I also found the printing to be clear and bold and the pages to be clean and uncluttered. The clear layout and the concise instructions made the program very easy to use. I appreciated how quickly I understood the program and was able to pick up the books and begin teaching right away. The lessons are very short and would work well for a wiggly little person. My kids don’t enjoy sitting for long – especially for a spelling lesson. I found they were able to focus during our short lesson time and they did not dread our spelling lessons. I found the lesson time to be “just right” for a young learner or a struggling speller. The amount of information in each lesson was not overwhelming and there was plenty of practice each week to reinforce the concepts. I am a fan of rule-based spelling programs. I love the logic behind the way most of the words (minus the exceptions…) are spelled. However, Curly still struggles with her spelling. I notice she often fails to apply the rules outside of spelling time. I’ve heard her say numerous times, “But it looks right!! !” That’s when I realized that she was ignoring the rules and simply spelling words based on how they “looked” to her. If the word looked correct, then she assumed her spelling was correct. This led me to explore other options for helping her with spelling – which is why I was so excited to hear about Spelling You See. This program does not teach rules or phonograms. The program is designed to help children picture words, consonant teams, and vowel teams, learning to spell based on patterns and repetitious practice. This is the perfect program for a visual learner. In addition, I found it easy to implement, requiring little teacher prep on my part. It also did not take up much time during our day, so our spelling time became short and sweet at ten minutes max! I plan to continue using a rule-based program as a reference for my kids (and myself) and reminding them of rules when needed. But I am planning to continue with this program in conjunction with our regular program to help my visual learners. I have seen progress as they spell words correctly outside of our spelling time. They are remembering how words are spelled as well as remembering common letter patterns. 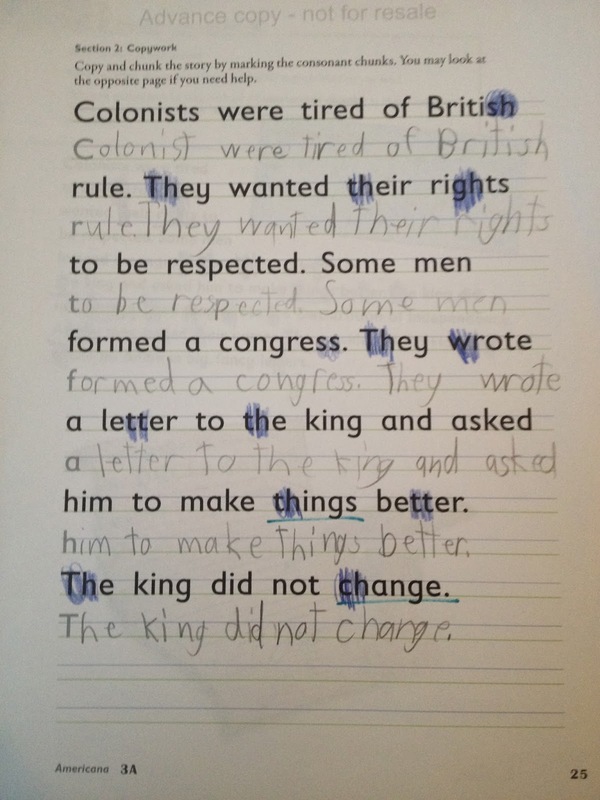 I also really enjoyed concept the teaching of spelling through copywork. My kids received lots of practice writing words correctly as they used this program. You can find Spelling You See on Facebook and on Twitter! Read more FAQs about Spelling You See.